could ever sing a song? it lasted all day long? it must've been quite loud. that it would draw a crowd. Each of the dinosaur names is written phonetically on the page where it's introduced, which certainly helped me read the book properly! My kids aren't actually big fans of dinosaurs, but they really enjoyed this book. I would expect that kids who love dinosaurs will love this book. Sgrignoli includes tidbits of facts within his funny stories, so it actually offers some real lessons about the dinosaurs, even while placing them in unrealistic scenes. It's also a fun example of poetry, which is something we haven't read very often. 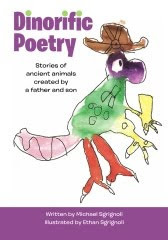 Visit the Dinorific Poetry website to read more about Dinorific Poetry, including the story behind its creation. This review was written based on a copy of Dinorific Poetry that I received from the author in exchange for an honest review. A special thanks to Sue at Great Books for Kids and Teens, who put me in touch with the author. I'm linking up to What My Child is Reading at Mouse Grows, Mouse Learns, so check it out if you're looking for more children's book recommendations! It looks like a terrific book. How fun it is that a child illustrated it. It's amazing what both kids and parents can do if they really put their minds to it. Thanks for joining WMCIR! This does sound a like an interesting book. I agree with Natalie the illustrations.